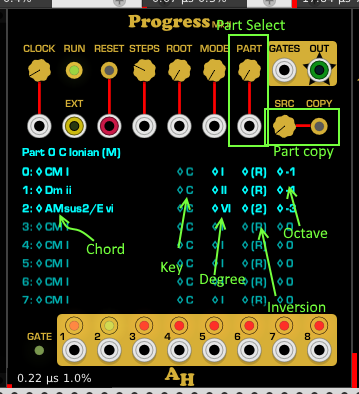 In v1.0.0 a new iteration of Arpeggiator will be released, breaking the functionality of Arpeggiator MKII (which is quite tricksy to use) into 2 modules (Arp3.1 and Arp3.2) which will contain almost all existing functionality in a much simpler format. 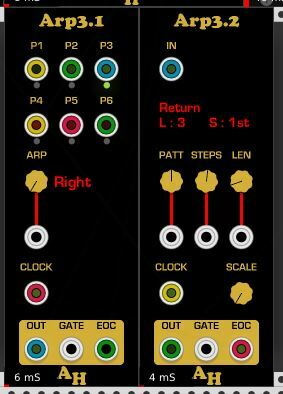 These two modules can be cross patched to create the complex sequences possible with MKII. What will be missing is the ‘trigger’ function. Having two clocking inputs was confusing and probably not helping people use the module. Deprecated means: It will not be maintained (any bugs reported will not be fixed) and will be removed completely at the next major release. Thanks for the news, John. I’m an avid fan of your modules, and I’ve been building and deploying the new versions as they appear on github. I’m not sure how I like the plan for Arpeggiator MkII, I use it a lot as-is, though I’ve never used the Trigger port. I guess that as long as I lose no functionality I can make the switch, though it will eventually mean reprogramming some patches. I would love to see some way to delimit the Steps to play a sequence beginning on any step (now the delimitation allows sequences starting only on the 1st step, unless I’m missing something). I’m not at all sure how you’d do that. Anyway, I’ll continue to follow your development path. Gotta love those Amalgamated Harmonics modules ! So - for example - ‘Strings and Arpeggio’ should be an easy patch to fix as Arp3.1 is a drop-in replacement. In any case, ArpMKII will not be going anywhere soon (not for another year at least). Your idea for starting on any step seems interesting and not too hard to do. I’ll take a look. All the development work I had planned for V1 is complete. AH modules build cleanly against the Rack V1 branch (at time of writing commit 487c24c). Any problems found are probably problems with AH modules not Rack, so bug me not @Vortico. I will continue to track the V1 Rack branch and work on a UI overhaul. Love your Progress module! I need to check out your other offerings! Thanks so much! Polyphonic outputs should usually copy the number of channels of one of the inputs instead of having a context menu item. The exception is when the module is the “source” of the polyphony, like an arpeggiator. @johnhoar Any chance getting CV control for Ruckus’s knobs? The exception is when the module is the “source” of the polyphony, like an arpeggiator. 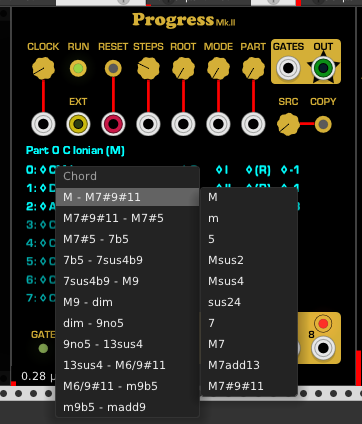 Bombe and Galaxy are chord generators using a fixed number of channels and the ‘old ports’ and context menu are included for backwards compatibility for patches which use the previous version of these modules. Any chance getting CV control for Ruckus’s knobs? It would be through a set of polyphonic inputs, so you’d have to use something like Merge to address the right control. Hi John ! I’ve been testing your v1 plugin for a while. It’s coming along nicely, not much more to add at this time. My tests are pretty light right now, they’ll get heavier as the v1 release date approaches. Just wanted to shout out some praise for the AH modules in v1. Progress 2 can shift the octave of a chord up or down by up to 5 octaves. As well as adding flexibility it can help in making chord inversions more useful. Remove gate outs and poly/mono options where not needed; Bombe, Galaxy and Progress output 6 channels all the time on poly and mono outs. Simplicity ftw.